The United States has warned Nicolás Maduro that his "days are numbered", before an international meeting in Bogota today with his rival, Juan Guaidó, to decide the next steps in the battle for Venezuela. Mike Pompeo, the US secretary of state, who will travel to Bogota alongside Mike Pence, the vice-president, condemned the violence and said he was confident Mr Maduro, the embattled president, would soon be gone. "Predictions are difficult. Picking exact days is difficult," he said, speaking on a US political chat show the day after violent protests wracked the South American nation. The violence looked set to get worse, however, after Iris Varela, Venezuela's prisons minister, announced she was bringing "trained" inmates from overcrowded and highly dangerous prisons to the border, to "have the privilege of fighting for the fatherland". "I'm bringing them here, and I will continue to bring them here, in significant numbers," she said, speaking in the border city of San Antonio. Mr Maduro, who is clinging to power with the support of Cuba, Russia and China, spent Saturday dancing on national television at a rally in Caracas. State television did not show the bloody scenes at the borders, where on Saturday two people were killed in a town bordering Brazil and two died on the Colombian border. Running battles on bridges from Colombia into Venezuela resulted in 285 people being injured on the Colombian side while trying to get humanitarian aid into the country. 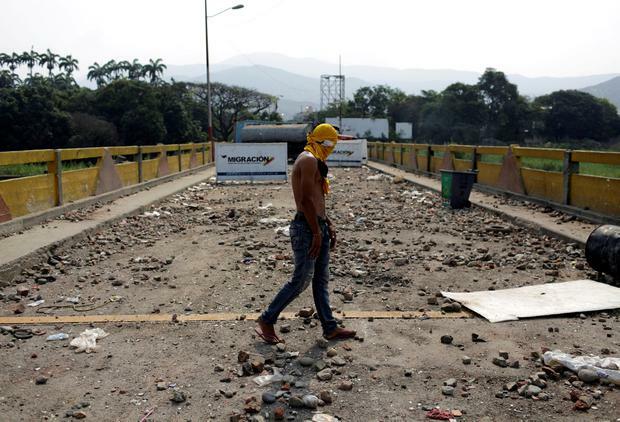 Some of the aid was burned on the bridges, with a witness claiming Mr Maduro's troops poured fuel on to the convoy. Colombian migration officials confirmed that 100 officers had downed arms and declared their support for Mr Guaidó, who last month declared himself the legitimate "interim president". Mr Guaidó had planned for an "avalanche of aid" to flow into Venezuela on Saturday after co-ordinating the delivery of hundreds of tons of supplies with the US, Europe and Latin American nations. On Friday, a fundraising concert organised by billionaire Richard Branson energised tens of thousands of Venezuelans to the cause. But yesterday, Mr Maduro mocked the efforts as a Washington plot. "They tried to disguise, with a concert and a supposed delivery of 'humanitarian aid' at the border, a plan which had been developed and announced by Donald Trump," he said. "The people are on the streets, mobilised and alert in every corner of the country. "I call on all men and women of good faith to not let their guard down and keep on the front foot of the fight to preserve the peace in Venezuela." According to a Reuters witness, two aid trucks crossed the Brazilian border but did not pass through a Venezuelan checkpoint. A Puerto Rican ship carrying humanitarian aid was ordered to turn back after a Venezuelan navy ship threatened to open fire on the vessel. "This is unacceptable and shameful," said Ricardo Rossello, the governor of Puerto Rico. "We have also notified our partners in the US government about this serious incident." Mr Guaidó's side was left licking their wounds and planning their next steps. Meanwhile, Freddy Superlano, the 42-year-old opposition politician who is one of Mr Guaidó's closest confidantes, was recovering from being drugged in the early hours of Saturday morning. Carlos Salinas, his adviser and cousin, died in the incident. Initial reports suggested he had been poisoned in a restaurant, causing immense alarm. Local media now claim he was drugged and robbed by prostitutes in a Cucuta motel. In Cucuta's hospitals, the walking wounded were vowing to continue the fight. Evaristo Jose Guerrero, a 27-year-old farmer, broke down in tears as he recounted how he was shot in the eye on the Francisco de Paula Santander bridge - one of four crossings where volunteers tried to bring in aid.